Constructed about 1875, this building was known as the Sparger Cotton Mill until at least 1885. The cotton mill was a short-lived enterprise and Sparger turned most of his attentions to his other mill which manufactured Golden Eagle Flour and other products. It still stands just off Commonwealth Av. in Bristol, VA. 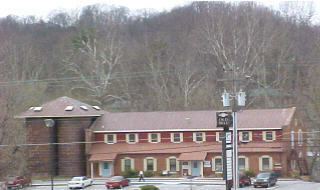 The mill pictured above is located on the Volunteer Pkwy. beside Beaver Creek in Bristol, Tenn. I believe Sparger gave up on the cotton mill, and it was later converted into a distillery by Gouge, Sams & McNabb, - which explains the four grain/corn silos. *Two other silos were on the right end. These were removed after the 1950s. The "known" Sams & McNabb Distillery was a short distance upstream from the Mill and converting the Mill into a distillery wouldn't have been all that difficult , neither would the transferring of materials, etc. to the Mill. Additionally, the building was in much better condition with more room than the original site. ** Note: E.E.Gouge pg.2 - the Sanborn map of 1912 shows the E.E. Gouge Distillery on the Virginia side of Bristol as having at least 8 grain silos, maybe more. One, K.J. Bryant of Bristol, VA. once informed me he was told that the words "Happy Valley Whiskey" were once painted upon the (now) back of the silos. Sparger Rd. once crossed Beaver Creek via a bridge to the other side ( then front) of the Mill. There was a mill wheel and mill race when the mill was constructed, but all evidence of them have been obliterated. The Mill was remodeled and improved in the middle 1980's and all traces of the aforementioned letters are long gone. **SAMS & McNABB DISTILLERY Dec.1907...Noted as "not in operation" on the above Sanborn Fire Insurance Co. map. As to why it wasn't operating. There are two possible explanations. (1) As both Bristol, Tenn. & Va .went "Dry" in 1907, perhaps the distillery shut down, albeit temporarily. Bristol, Va. returned to "Wet" staus in 1909. (2) The distillery was re-located to the former Sparger Cotton Mill ,(sometime after 1902 ),with the grain solos being constructed then , along with other required renovations. It was about 1904 that Gouge became partners with Sams & McNabb, perhaps this is when the move to a new location was accomplished. 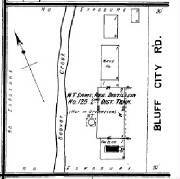 The Sanborn maps below are from 1892 and 1902. They show the Mill with no silos. The next map I could locate is from 1948 and the Mill was noted as the Bristol Bedding & Upholstery Co. and the 4 silos can be plainly seen. **In the 3 above maps the "stream" you see close to the Mill is actually the mill race & tail. 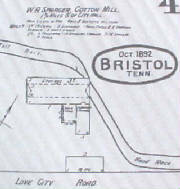 Beaver Creek is further behind the Mill & a section of it is plain in the 1948 map ,as are the 4 grain silos. 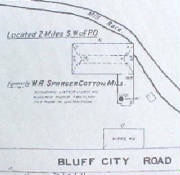 Also, in the 1st map, Bluff City Rd is noted as Love (sic) City Road. Buried: 4 Sept 1939, East Hill Cemetery, Gouge Plot, Bristol,Va. **Note: A few years ago, a descendant of E.E. Gouge, who lives near Etowah,TN., visited with me. She informed me she was looking for a Gouge quart cylinder bottle that had his profile embossed upon it. She had one until recently, but had broken it. She seemed to think it wouldn't be difficult to find a replacement. She was disappointed to learn she may have had the only known example, as neither I nor anyone else in the "know" had ever heard of, much less seen, such a bottle. She was to have sent me additional info about this bottle, but I have yet to hear from her. ***Note: Another local personage ( now deceased) , Mr. Dan Crow of Kingsport, always believed there was a Happy Valley whiskey bottle embossed as being from Elizabethton, or Carter County, TN. After all, Happy Valley is in Elizabethton. He searched for years without ever finding tangible proof.